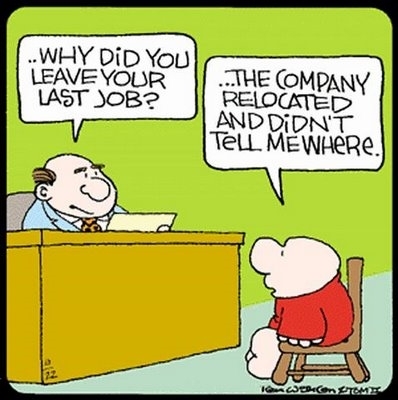 “Why did you leave your last job?” That question comes up during almost every interview, and on most job applications. Explaining why you left your last job – or for that matter, pretty much every job listed on your résumé – is something that certainly requires some thought. The answer you give must be both truthful and somehow palatable. It should ideally be easily understood and logical, and yet at the same time not cast you in a negative light to your potential future employer. If you do not provide an explanation for why you left a job (particularly if it was a short stint) the person screening it could read it as a negative: you might be a job-hopping flight risk … you seemingly can’t hold down a job … perhaps you don’t get along with others well … there may have been performance issues that got you fired – the imagination creates all kinds of possible scenarios! There may be perfectly acceptable reasons for why you left each job on your resume. I would advise briefly listing those reasons right next to the dates on your résumé to avoid this obvious red flag. The idea here is to be pro-active, and answer questions about why you left each job before those questions are even asked. It’s a simple thing, and yet very few people do it. You don’t need to go into long-winded or detailed explanations. All you need is a brief phrase, in parenthesis, following the dates of each short-lived position. For example: “Laid Off Due to Economic Circumstances” … or “Position Eliminated Due to Company Restructuring” … or “Company Went Out of Business,” etc. What this does is provide the screener with a perfectly valid explanation for why you left each job, and eliminates the possibility that they will imagine something much worse – i.e., that you were fired “for cause” (meaning your actions caused you to be fired) or poor performance, etc. Of course, if you actually were fired “for cause” … well, that’s another story! Naturally, if it was your decision to leave a company and move on to another job elsewhere – it’s usually pretty easy to say something like: “Left for a better opportunity.” The problem arises when leaving was not your idea. If you were let go “for cause” it’s the most difficult scenario to explain going forward. You need to tread carefully. On the other hand, if you lost a job due to circumstances beyond your control (e.g. company-wide layoffs, poor economic conditions, etc.) then using the right euphemism can often satisfy an interviewer’s questions and explain why you left, and why there may be gaps between jobs. If you’ve heard any other euphemisms for leaving a job that aren’t already included on this list … feel free to add your new terms in the comments section below! Entry filed under: Advice for Job Seekers.